Contest 2012 | SAMARITAN INTERNATIONAL e.V. 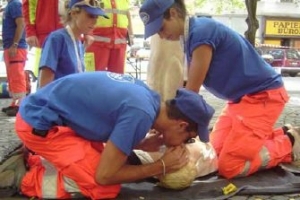 Four days first aid, exchange and a whole lot of fun: more than 1,000 youths and young adults participated in the 4th SAMARITAN Contest from 26th to 29th July in the Latvian capital Riga. Every two years, the best young first aiders of the international network SAMARITAN INTERNATIONAL meet to test their knowledge, measure their skillfulness and find new friends from other countries. This year, the 4th SAMARITAN Contest took place from 26th to 29th July 2012 in the Latvian capital Riga with more than 100 youths and young adults between the ages of 15 and 27, hosted by the Samaritan Association of Latvia (LSA) which organized the event in cooperation with the general secretariat of SAMARITAN INTERNATIONAL and the emergency training department (ASB). 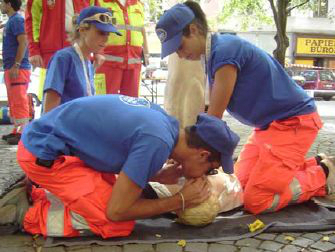 A total of 17 teams of the European Samaritan organizations ANPAS (Italy), ASBÖ (Austria), Arbeiter-Samariter-Jugend (ASJ Germany), ASSR (Slovakia), CB (France), LRV Weißes Kreuz (South Tyrol), LSA (Latvia), LSB (Lithuania) und SFOP (Poland) competed against each other. This year again, the aim was to cope with demanding tasks. At first, each team had to demonstrate its general knowledge and its first aid skills in a one-hour-times written test Afterwards, dexterity games took place in the museum of medicine: Whether memory or stinging beads, building towers from wooden blocks or estimating weights – concentration, speed and accuracy were required. As first aid has indeed much to do with knowledge, but even more with exercise, the Latvian organizers had prepared demanding first aid stations at different places in the city. In a judo hall there was at first a training accident in which a judoka had sprained her hand – shortly afterwards a viewer who was in danger of suffocating on a snack needed help: Who had mastered this situation was sent directly to a public swimming pool to treat bloody noses and lacerations after a scuffle among the guests in the cellar bar. And also in the Railway Museum and the Fire Service College the young medical helpers had to cope with emergencies – here young Samaritans, painted in a deceptively real way, pretended to be burnt and had to be treated. All in all, a total of 80 volunteers kept the young first aiders on their toes with real-world scenarios – the teams accomplished the tasks perfectly. The Latvian teams achieved the best results: the first place both in the group aged between 12 and 15 and the group aged between 16 and 27. The team of the White Cross in South Tyrol achieved the second place. The German team from Offenbach and Bavaria were pleased about winning the third place. A trophy went also to the White Cross as the team achieved the best score in the overall ranking together with the Latvian first aiders. Christian Reuter took the opportunity to thank the Latvian partner for the successful cooperation: In his capacity as Secretary General of SAMARITAN INTERNATIONAL he presented the Latvian Health Minister Ingrida Circene with a small glass sculpture with insert letter of thanks for the extraordinary good cooperation. Likewise, both the President of the Samaritan Association of Latvia, Ilze Briede, and the managing director of the Samaritan Association of Latvia, Andris Berzins, were given a badge of honor for 20 years of successful work. Apart from this, a meeting took place with ASB and LSA representatives, the deputy mayor Ameriks and the heads of the welfare departments of the city of Riga. During the visit to the town hall the cooperation agreement with the ASB, concluded 20 years ago, was especially honored. Christian Reuter, ASB Federal Director, received on behalf of the efforts of the ASB a certificate of honor. Special mention must be made of the award for Lothar Remme, director of the Bildungszentrum Ritterhude, who initiated 20 years ago the cooperation agreement, and for Uwe Lohmann, chairman of the ASB Hamburg West, who contributed significantly during the past years to the cooperation of the Samaritan Association of Latvia and the city of Riga.